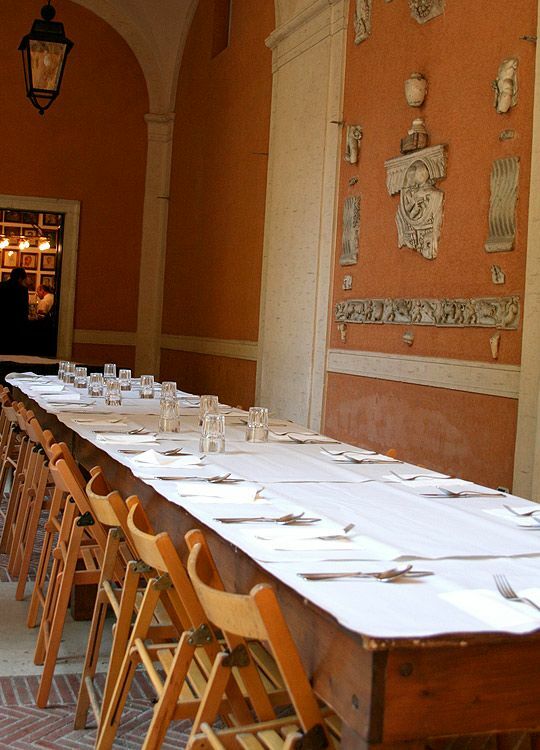 A table set at the American Academy in Rome. About two years ago I wrote a letter to Mona Talbott, the chef then presiding over the American Academy in Rome’s newly revamped kitchen. The Rome Sustainable Food Program, as this revitalization is called, was conceived by Alice Waters in 2007. Miss Waters placed Mona Talbott, a Chez Panisse alumna, in charge, trusting she would be the right person to completely overhaul what evidently had been a lackluster, disconnected cafeteria. Under Miss Talbott’s care an elegant kitchen based on La Cucina Romana, both traditional and creative, emerged. Organic vegetable gardens were planted on the grounds of the academy, and meats and cheeses where purchased locally from some of the best purveyors in Rome. I soon began hearing very good things about this big kitchen, a kitchen that must feed all the artistic and academic fellows who visit the American Academy each year, along with the organization’s large staff. So with my industrious little mind churning, I thought, what these people now need is a fancy new cookbook to go with their spruced-up kitchen, and I’m just the gal to write it. So off went my letter to Miss Talbott, suggesting just that. Uh, well, she wrote me back, “I’m now working on the American Academy in Rome cookbooks.” Duh, of course she was. She was, after all, the chef. Boy did I ever feel stupid (my usual motto is “It never hurts to ask,” but it can occasionally have embarrassing ramifications). The American Academy in Rome cookbooks are now just coming out, issued as small single-subject books. Last week I went to a gathering at the Academy’s New York office introducing the second in the series, all published by the Little Bookroom. Miss Talbott’s first was Biscotti. This new one is Zuppe. Now, a book on soup recipes is something I never thought I’d really need, soups being so improvisational by nature, but this little collection is different. It has soul, partly because it’s inspired by Rome, giving it a unified feel, but also because all the soups look really good. At the event we sampled two soups from the book, one with farro and pumpkin, the other a lentil and spinach soup with hot chili oil (the grains and legumes, by the way, were provided by www.gustiamo.com, the best Italian food importer in the country, so obviously Miss Talbott doesn’t kid around, even when on American soil). Both were excellent, perfect winter-into-spring transitional dishes. The farro soup got me remembering how much I really love farro soup. That might seem a weird thing to say, but if you’re like me and cook a lot, juggling myriad ingredients every day, you’ve probably had the overwhelming feeling that there are so many foodstuffs (at least in this country) and ways to put them together that sometimes great ingredients fall from your repertoire for a while until coaxed back by, for instance, a new cookbook. I hadn’t cooked with farro in almost a year. But it wasn’t just farro that jarred my culinary recall. When I got Zuppe home and started paging through it, I was repeatedly reminded of soups my family had made when I was a kid, especially my father’s Puglian mother’s soups (she was the inspired cook in the household). Not that they were the exact same ones, but Miss Talbott’s recipes, chiefly through their ingredients, captured the essence of soups from my childhood, with escarole, dandelions, baby meatballs, pumpkin, zucchini, chickpeas, green peas, grilled bread, chicken broth, pecorino, tomatoes, cannellini beans, rosemary, prosciutto ends, bay leaves, nutmeg, anellini, pastina, and stellini, to name a bunch of things. When was the last time I cooked anything that contained tiny stars? For me the best way to use this beautiful collection of recipes is by concentrating on the ingredients Miss Talbott has chosen, giving them a gentle shake in my head and then just seeing where they land. An improvvisata. If you prefer, you can, of course, make any of these great soups just straight, but for me they beckoned to be meditated on. I happened to have a package of Gustiamo farro in my pantry, so as soon as I tasted Miss Talbott’s soup at the signing I decided I really need to cook up a pot of farro right away, maybe even in a soup. Here is my resulting tribute to the soups of the American Academy in Rome. Bring a medium pot of water to a boil over high heat, and drop in the farro. Cook at a low bubble until the farro is just tender, but still has a bit of a bite, about 18 minutes (taste a piece after about 15 minutes to check where it’s at). When it’s cooked, drain it well and tilt it into a bowl. Toss with a drizzle of olive oil and some salt. Choose a large casserole or heavy-bottomed soup pot fitted with a lid. In it heat a few tablespoons of olive oil over medium flame. When hot, add the prosciutto, onion, carrots, and fennel, and sauté a few minutes to soften. Add the chicken, seasoning it with salt, pepper, nutmeg, rosemary, and the ground fennel, and brown it lightly all over, about 10 minutes. Add the garlic, and sauté a minute or so, just to release its flavor. Add the Marsala, and let it reduce by half. Add the chicken broth and enough water to just cover the chicken, if needed. Turn the heat to low, cover the casserole, and simmer, turning the chicken occasionally, until it is very tender, about ½ hour. Remove the chicken from the broth. Skim most of the fat from the surface. When the chicken is cool enough to handle, pull the meat off it and cut it into chunks. Discard the skin and bones. Add the chicken meat to the casserole, along with the farro and the escarole. Simmer on low heat about 2 or 3 minutes, just to blend the flavors and wilt the escarole. Taste for seasoning, adding a bit more salt and black pepper, if needed. Add a drizzle of fresh olive oil. Serve hot or warm, topped with a sprinkling of grana Padano if you like. Thanks for the lovely review. I applaud their stellar work and serious commitment. Thanks for the info about the book, and for another terrific post. Your welcome Adri. And Happy Easter to you. That is a lovely review. I want that soup! Thanks Mom. I’ll be making it for you. I’m a soup nut from way back when. Always order soup du jour when I visit restaurants because I know it’s one thing that’s absolutely fresh on the menu. You have a lovely writing style, Erica. Some years ago I wrote that Garrison Keillor – one of my all-time favourite humourists – writes as if his words are gliding along on the finest lubricating oil. I describe this quality of writing as, “Featuring sentences without any ‘lumps’ in them”. You, too, have a very smooth writing style. Could you be Mr. Keillor’s long lost sister, by any chance ? Did your father spend any time up in Minnesota ? (LOL). I know I’m very wicked, but, hey, that ‘s what us southern Welsh guys are like. My writing, as you probably can figure, doesn’t start out lumpless, but I suppose becomes more so after tinkering. But thank you so much for the kind words. It means a lot to me. And, uh, no my father never spent time in Minnesota. That really would have been a prison sentence for him. Sounds great. I want to try that. Did you ever painted at the Academy? I haven’t been yet, but I’d like to go and finish my cooking memoir there. Also wondering, do you have any paintings of cooking pots or ceramic food pots? And also, please let me know if and when you’ll be giving a show. I’d love to attend. Say hi to dad for me and Fred.